Irrigation today means much more than having a simple way to keep up with watering your lawn or garden. With vast improvements in technology, installing or updating an irrigation system means major savings in relation to water consumption. From hi-tech controllers to water saving nozzles, we can install a new system from scratch or update an existing system to meet today’s water consumption standards and whether you are a homeowner or in charge of an entire commercial site, that translates into real savings. 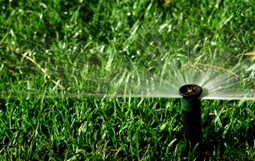 Contact us today to find out how easy and affordable it can be to make your irrigation system save you money.